When using a bootloader (see “Serial Bootloader for the Freedom Board with Processor Expert“), then I usually protect the bootloader FLASH areas, so it does not get accidentally erased by the application ;-). When programming my boards with the P&E Multilink, then the P&E firmware will automatically unlock and erase the chip. That’s not the same if working with the Segger J-Link, as it but requires extra steps. What I need is to unprotect the memory and then erase it. The Segger J-Link features a very fast programming. Part of that speed is that the Segger firmware checks each FLASH page if it really needs to be programmed, and only then it erases and reprogrammed that page. So downloading twice the same application actually will not touch the FLASH memory at all. Additionally, it does not do a complete erase of the device: it only programs the pages I’m using in my application. The advantage of that is first speed. And it does not erase the application data I’m using in non-volatile memory (see “Configuration Data: Using the Internal FLASH instead of an external EEPROM“). However, sometimes I really need to clear all my data in FLASH too, and then I need to erase all my FLASH pages on the device. 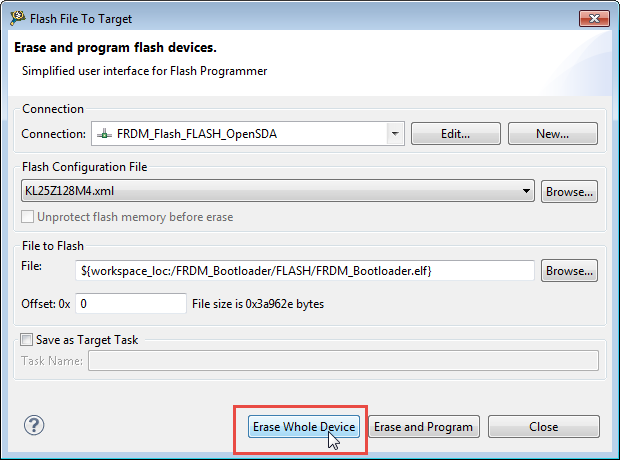 Segger has product named ‘J-Flash’ which is used to Flash and Erase devices outside of an IDE. 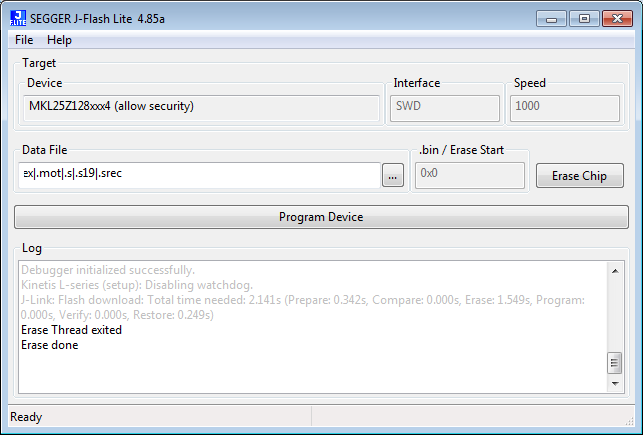 There is a free-of-charge ‘Lite’ version available for download from Segger. This utility is not intended to be used for production. With this utility I have a GUI to erase and program my device. But J-Flash Lite cannot unlock my locked FLASH pages :-(. Again, this does not work if the device is locked. CodeWarrior has another feature called ‘Target Task’ which can be used to erase/unsecure (if your device is supported), see “Device is secure?“. So I need to use a different tool to unlock and unprotect my device: the J-Link Commander. ❗ I need to do the erase operation right after the unlock. a) set device b) unlock and c) erase, otherwise it will fail? In order to re-program the protected FLASH sectors with Segger J-Link, I need first to unlock and mass erase the device. 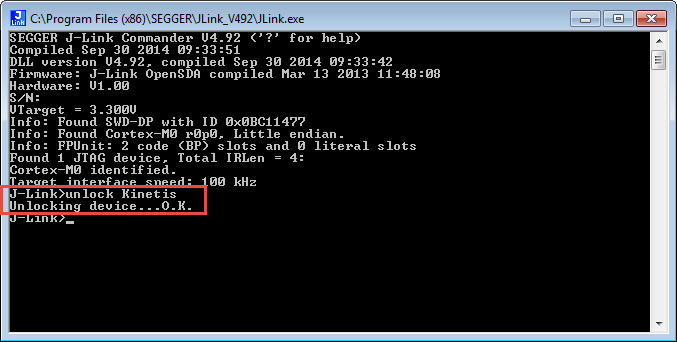 For this, there is the J-Link Commander utility which has a command line interface to unprotect and erase the device. 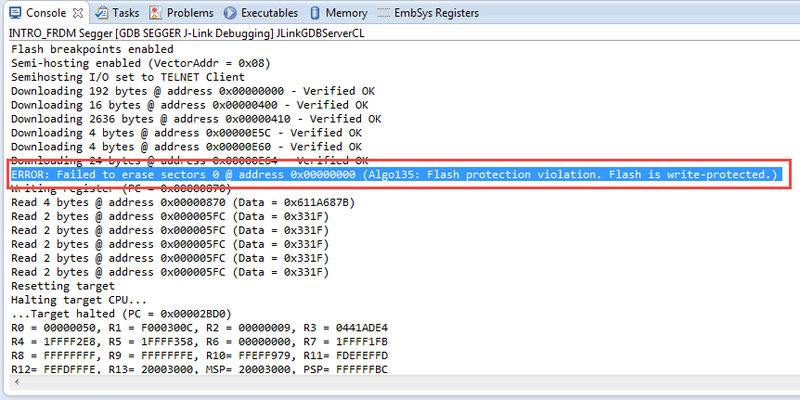 For erasing only, the J-Flash (and Lite) is a very useful tool, especially to get a ‘clean’ device memory. To me, the Segger way and tools are very powerful. In this case, things are very flexible, but not that obvious. So I hope this post can help others to get his device unlocked and erased. This entry was posted in ARM, CodeWarrior, CPU's, Debugging, Eclipse, Embedded, Freescale, Tips & Tricks and tagged CodeWarrior, Debugging, Eclipse, Flashing, J-Link, P&E, Segger, technology, Tips&Tricks by Erich Styger. Bookmark the permalink. KDS shoud have an option to unlock flash or at least hint user more precisely what to do in its log. Thank you for this this exlanation. It saved me a lot of time. I am trying to use similar procedure as yours to “erase my secure Kinetis KV31 device”, I use J-link utility – unfortunately I can’t erase it due to device is secured. ERROR: Erase returned with error code -5. Is there a way to unlock secured device and erase it? I am OK with deleting my flash I just want to reprogram device again. are you using the latest Segger J-Link firmware and drivers? I do not have a KV device, so cannot try out things on my side. Otherwise I recommend that you contact Segger (they are usually very responsive). first, I would look at the reset line: is it properly pulled up? Is the capacitor on the reset line not too big? If it is to big, then the debug probe might not be able to pull it down fast enough. The other thing with the K64F (and others): make sure you have disable the EZPort of the device, as otherwise the device wants to load/boot from the EZPort. I Had the “Device is secured” problem on 2 of 5 MKV31F devices. Using universal multilink i had no way to unlock it,and the odd thing is that one of the devices was new,so i was not able to flash it for the very first time.The project that i tred to load was working fine with other boards let’s call it “A_project”. 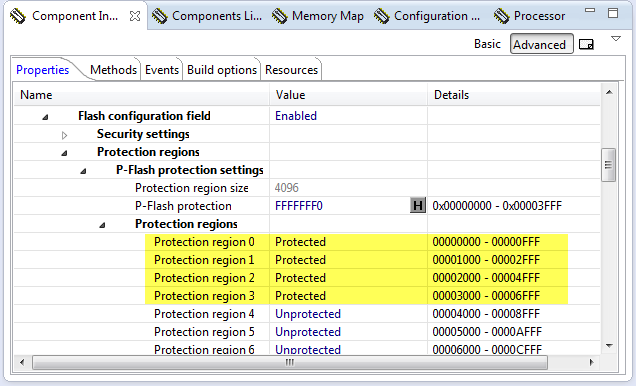 Furthermore the reset pin toggles continously(it has 10K to VDD,100nF to GND). I dont ‘have a Segger J-Link,but almost for shure i should have some demo board with a J_Link on board. Do you think i can do something? This is a 100 pins IC,and i ‘m am scared that after changed it by hand ,i could face the same problem. yes, using a J-Link might work for you. The ‘real’ J-Links have stronger pull down circuit I think so would be better. But give it a try. Ultimately, I always have J-Link at hand for these kind of things. The reason why you see the reset pin toggling is that the device is continuously resetting: it starts, then runs into a hard fault, restarts again, etc. You might try as well to pull down (e.g. push button) the reset line while you connect to the target. This would give the debug probe a chance or larger time window to connect to the microcontroller and halt it. You migt try this several times. will this tool work for all controller, lets say I am using sj 63110 and the memory is locked, I am not able to unblock now, how can I do this please help. You need to check the UM08001_JLink.pdf from Segger (J-Link User manual) as the unlocking is specific for each device. As far as I see Kineits, LM3Sxxx and EFM32Gxxx are supported. Similar to the “Kinetis Recovery Utility” you mentioned in a previous post, do you know if it is possible to use JLink to connect to a board where the RESET pin has been set to GPIO via the FOPT config byte? No, there is no utility for this as far as I know. So in your case the reset pin is still active after power-up until it reads the FOPT register. With JTAG you can reset the device using the JTAG command. So if you are using JTAG, you should be able to connect. If you only have SWD, then you need to be able to connect with the debugger during this tiny window. So I would try to debug it while the microcontroller is powered up. You might need 10, 50, 100 or more tries, but I think this is what you can do. The other way is that you add a button to the reset pin and pull it to GND. Give it a try. regarding your post I’m having a similar problem with internal KE02 EEPROM. Any idea or suggetion to solve the problem? not sure, as I’m not using that device. But it seems to me that the Segger J-Link has a problem to access/read the internal EEPROM (that’s located at 0x100000000, right?). Is this related to unlocking the device or just about using the EEPROM? In any case, I think the best would be if you contact the Segger support (they are usually very responsive) about this. I thought it could be a KDS unlocking problem or advanced settings to be set, but probably you are right. I will take your advice. trying to do FLASH erase on my secure Kinetis MKV31F512xxx12 device. You did not provide your JLink commander command, but if you have secured your device with mass erase disabled, there is no way you will be able to recover it. You would have to unsolder your MKV32 and replace it with a new one.